home News Antimicrobial copper in the built environment: Good idea? Antimicrobial copper in the built environment: Good idea? One of the problems I’ve faced as a microbiologist attempting to learn about the built environment is the incredible amount of snake oil and pseudoscience that swirls around the edges of the field. There’s a huge body of solid, peer-reviewed research in the field of course. But there’s a lot of company-sponsored pseudoscience out there as well. We’ve posted about a number of these kinds of things… particularly those that imply all microbes are dangerous or that they have a magic cure for sterilizing a building. Then there are the things that I just don’t know enough about. 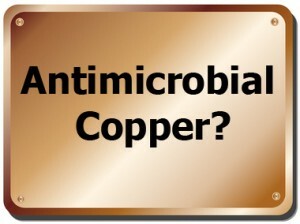 For example I’ve been hearing more and more about “antimicrobial copper”… the coating of surfaces with a copper alloy that dramatically reduces colonization of those surfaces by bacteria. Curious whether this was snake oil or good science I started with the Wikipedia article. Based on that, it seems like it might be a fairly good thing to use in intensive care units and the like. I wouldn’t want to live in a copper-plated house (don’t forget those good microbes!) but I can see the uses. Seems to avoid many of the issues with antibiotics as well. What I can’t find are any microbiology-based arguments against it (just the price, and the tarnishability of copper). Anyone know of a good reason why more copper surfaces wouldn’t be a good way towards reducing microbial loads in places where that’s important? David — excellent comment and questions! You have hit on a lot of the important questions. Thanks. I have no answers, just some more questions. On the negative side, if copper must be kept clean for health or aesthetic reasons, is the use of chemicals to clean it. Copper is used effectively for roofs and downspouts in Europe and allowed to tarnish. I find the green ‘patina’ (if that’s what it’s called) attractive. But surely this is not what is intended for its use indoors. On the negative side for copper use outdoors: there is so much copper roofing and downspout use in Stockholm, a city with lots of water bodies in and around it, that the leaching of the copper into the water has been found to alter the marine life in those waters, not necessarily a desirable outcome. On a similar note, I wonder how much standard cleaning agents would tarnish the copper or otherwise interfere with the activity. In clinical trials reporting from around the world (inc. UK and US, the latter being funded by the Department of Defense) standard cleaning procedures were followed for the ‘antimicrobial copper’ items. Same cleaning products and same frequency of cleaning. Lab studies have been done as well (at the University of Southampton) that show tarnishing doesn’t adversely affect antimicrobial efficacy. We have been developing keyboards made with solid copper keys and front surface. Most hospital fixtures like this use a copper alloy which does not tarnish like pure copper but retains its bactericidal properties. Coatings and plated copper have not been registered with the EPA so only solid surface copper may make these claims. The copper surfaces must be cleaned at regular intervals or bacteria will survive on the dead bacteria. Please go to http://www.antimicrobialcopper.com for more information. Really good discussion. Also, we should not forget that there are people allergic to copper. Not everything can be coated with copper.